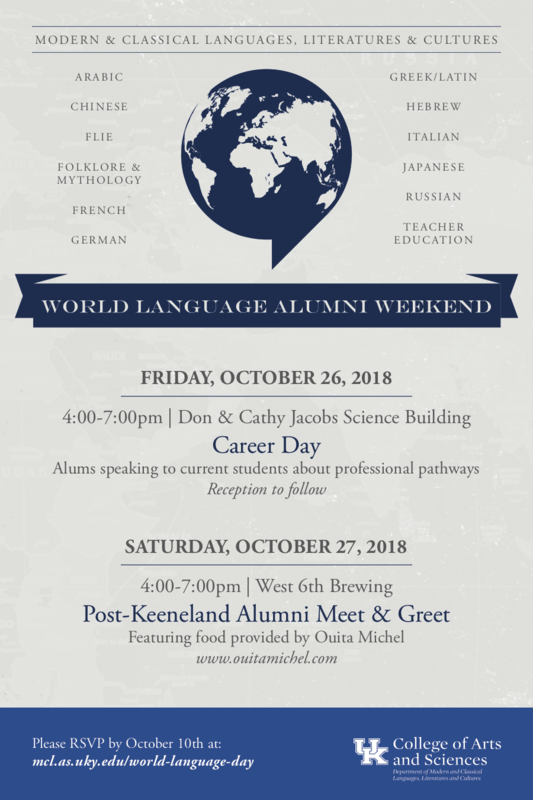 The Department of Modern and Classical Languages, Literatures, and Cultures will host World Language Alumni Weekend featuring Alumni of the MCLLC Department speaking to current students about professional pathways (informally and one-on-one) within the department. Current students are invited to drop by between 4-6:30 and speak to alumni in a variety of professions (law, medicine, IT, translation, education, non-profits, government, business and more), about the range of career options for FLIE or Language and Culture majors and preparing for them. Reception to follow. Alums, you and your guests are invited to the Meet and Greet with current and former language faculty on Saturday as well. RSVP link below.